PAX BRITANNIA: Pax Britannia Week: Time's Arrow - the first review! 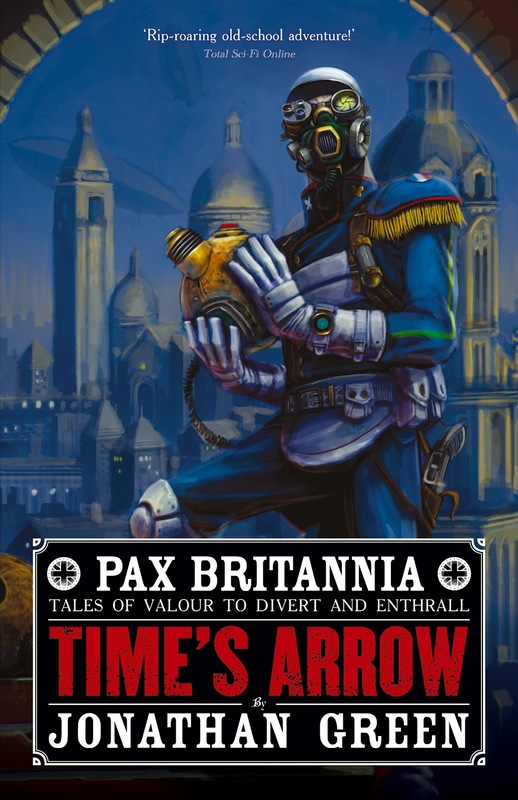 Pax Britannia Week: Time's Arrow - the first review! The following review (and the first, as far as I am aware) is by Matt Sylvester, founder of the Exonian Friendly Society of Steam & Burlesque. Take it away, Matt! First things first, Jonathan Green is one of the most humble authors I have ever had the pleasure of meeting, almost as if he truly is not aware as to just how good he is. Fortunately, this makes writing this review easy. 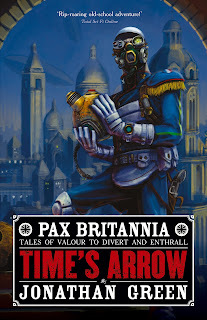 Time's Arrow - released on November 13th 2012 - is the eleventh book in the Pax Britannia series under the Abaddon banner and the eighthUlysses Quicksilver adventure. For those not aware of who Ulysses is, the easiest way to describe him is as a mix of Bertie Wooster, the Scarlet Pimpernel, James Bond and the Saint. Only far cooler as he lives in a present-day Victorian Empire (if you want to know more, buy the books!). Not only that, this book was originally written in three parts and, this is what makes the book unique in my not so humble opinion, it was entirely driven by the wishes of the readers. Jonathan initially started by writing the first third. When that was completed, he released it and asked the readers what they wanted to happen in the next installment. When this was written he did the same and wrote the third and final installment. I know of no other author that has approached writing his book in such a way and I have to say that I love this approach. Despite being broken down into three parts when he was writing it, the reader would never know that it had been broken down in such a way. Time's Arrow, as with all of Jonathan's Pax Britannia books is packed with popular culture references. It was at a reading that he gave whilst speaking at Asylum 2012, that I asked whether he used to play a certain video game obliquely referenced in a pivotal moment of the story, and there were a number of other references, both subtle and unsubtle liberally sprinkled through the story, some of which made me chuckle and some that made me groan. The story as a whole is just like the other Ulysses Quicksilver books, they start off at a nice quick trot and then start to canter. Before you know it, trumpets are sounding, lances are lowered and you find yourself charging full pelt in a flurry of excitement and action that keeps you turning the pages until you either reach the end of the book, or your legs turn numb and you realise that you have become one with Armitage Shanks. Full of love-sick whores, terrorists, animal abuse, murder, bombs and beautiful women, as well as some time travel, this book is a perfect addition to anyone's bookcase - or kindle - and I heartily recommend that you purchase it, it is truly a tale of valour to divert and enthrall. I heartily recommend that you get this book. Now.